The pinhole-sized microphone input on your laptop is obviously not going to give the highest quality audio. For podcasters and some business people you just can’t accept anything but the best quality. Samson has a product for that core group of people called the Samson Go Mic. A USB powered high quality microphone that uses the high quality components of a studio microphone, but designed to be packed up with your notebook. How many times have you tried watching a Youtube video on your laptop/netbook and have not been able to hear the audio? The itty-bitty speakers they put in most of them are about worthless. Sure, plugging in any old set of speakers will give you better sound, but do you want to lug those things around with you to the coffee shop? You might as well be "that guy" who brings the whole office and sets up shop there. Wouldn't you rather have one that slips into a side pocket of your bag and doesn't weight a ton? The Choiix Boom Boom may have a funny funny name, but it could just be the answer to your sonic woes. SteelSeries has stuck with the 5H as their flagship headset for some time now so it was kind of a surprise when they announced the 7H a few months ago. Not wasting any time I made it known multiple times that I was very interested to take a look at their newest flagship headset. It's hard not to get a little excited, we enjoyed the Siberia v2 series when we tested them and we know their 5H series has a large following as well. What could possibly follow in those large footsteps? Today I have the chance to take a look at the Strato Headset from Ozone. Previously, we took a look at their Smog during mouse week and their ground level mouse pads soon after. They obviously have a strong focus on gaming. I hope that focus carries over to the Strato headset; I plan on putting it to the test in a few too many sessions of Modern Warfare 2. Named after a triple system that lies light-years away from Earth, the Keid is Mionix's first contender in the gaming audio realm. Mionix strives to create professional yet ergonomic products, two criteria kept well in mind during the development of their maiden headset. Today we sit down to see if the Keid 20 shines brightly or fades away. Always looking to perfect their products, SteelSeries recently introduced a redesigned version of their popular Siberia headset called the Siberia v2. We had great things to say about the original in our review of them this past September, now we have a opportunity to see what kind of changes they could do to an already great headset. Early this year I had the chance to check out a new and exciting pair of ear buds from Razer called the Moray. Overall I was very happy with them but I felt that they needed more of a gaming edge coming from Razer. Not long after our review they announced the Moray+. Apparently Razer was thinking the same thing as us because the Moray+ addressed that issue specifically. Today I have a chance to take a look at the Moray+ and see how there improvements helped. 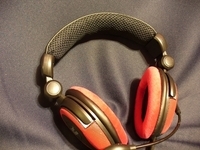 It wasn’t that long ago that I took a close look at the SteelSeries Siberia Neckband headset. My complaints almost all came from the neckband holding the headset up. Steel Series does make a Siberia headset that has a standard headband. Today I have the chance to test it out, and to spice things up a little bit this one is bright red, If my wife’s excitement is any indication the Siberia Full-Size headset should be nice. When it comes to headphones and microphones for aviation and some of the biggest names in music they have relied on Sennheiser products for years. It was only natural that they would venture into the gaming headset market. In the time sense then, they have made a name for themselves with high quality sound along with microphones. Their most recent gaming headset the PC-350 is their top dog with full over the ear cups that I love so much. After a little begging they sent a pair for me to try out, let's see if they live up to their reputation. Over the past few years I have reviewed a wide variety of gaming headsets. On our trip to Million Man Lan a few weeks ago I saw something that really caught my eye. A couple people where wearing helmets with built in headsets. Apparently a company called GameSkulls was showing off a couple of their first product. After trying them out myself and talking with Gus from GameSkulls my interest was definitely peaked. Before we left Gus dropped one off at my desk for me to checkout, Now I don't have to worry about being attacked by my wife while playing my games. When it comes to high quality headphones you will almost always find yourself balancing great sound quality, comfort, and price. Recently Skullcandy introduced 2XL, a brand focusing on individually styled headphones at prices anyone can afford. Being a big fan of over the ear headphones I was excited to have a chance to take a closer look at their Brickyard style headphones, a DJ-style headphone that is according to 2XL "DJ-style headphone with over-ear design, comfort headband suspension and full dynamic acoustic range". 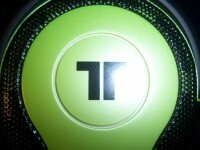 Some time ago we reviewed Tritton's quality headset, the AX51 5.1 Headset. At that point I was thoroughly impressed with the set, so much so in fact, I took them to our last local party LanOC V.3. I decided that even with the power brick as an anchor, the superior quality warranted the hassle. It seems that Tritton was dissatisfied with their previous attempt at chaining me to my desk with just one adapter because they just released a new top of the line model: the Tritton AXPro. As you may have guessed, this device's number of earthly tethers are greater than the last, possessing a staggering two power adapters for one single headset. Tritton sent us one of these beastly headsets to see if they live up to their status as well as their power consumption. This means that, once again, as we review this headset, I can no longer move from my workstation. My name is Thomas Gilligan, and if you are reading this, I am being held against my will by the Tritton AXPro. In the past, we have worked with Steelseries with our lan parties and reviews. Considering their focus on creating performance enhancing gaming gear, it's not a surprise really that we have a close relationship with them. Today I will be looking at their Siberia Neckband headset. With a neckband design being much different than any other headset I have tested I am excited but unsure how it will perform. Although considering past experiences with Steel Series I'm sure it will be a quality product. When I went to CES this year at Las Vegas, NV, I went into it knowing I would be the person to check out the stuff Wes couldn't make it to. While I was there, ifrogz was nice enough to meet up with me to show off some of their new headphones. I meet up with spoke with their Media Relations Specialist Ashley she showed me around to some products. I was impressed with their products and loved the ability to customize your own headphones in the Earpollution line. I was even more impressed when Ashley handed me a gift card to customize my own set. After getting back home and settled in I took a look at their website and decided to order a set of Fallout's. Recently Razer has jumped into the Audio market in full force with a variety of headsets, speaker systems, and even a sound card (ok this has been out for a while but still). Obviously all of their products are geared towards the PC gaming community. One of their new products that stands out in the Moray, "Designed for gamers, the Razer Moray delivers immersive gaming audio or music on the go in a sleek, compact package." The Moray could be a more compact replacement for my Razer pro|tone m250's. If you're playing games while on the go or even looking to bring razer style along with you and your mp3 player make sure to check out how they performed for us. Something about being tied to your pc while you are listening to music and watching movies by a cord isn’t what I would consider comfortable. I like the idea that I can move around without being limited by a cord. This is where Kensington’s Bluetooth Stereo headphones come in. Running on Bluetooth they are compatible with a variety of devices. We are going to test them out with a laptop and on a Bluetooth enabled cell phone. 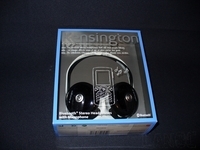 We have had great experiences with Kensington products, will this one be the same? Will they hold up to our abuse? Click below to find out. When you are traveling with some of your high end, high tech, and high priced gadgets it can sometimes be a little stressful. This situation is multiplied when you are taking your pc to a lan party or something similar. When you are doing all of this every piece or part has a chance of being damaged. Of course you’re going to focus on your monitor and tower, but what about everything else, specifically your headset? You wouldn’t want to get there any they are damaged would you? I know I wouldn’t. 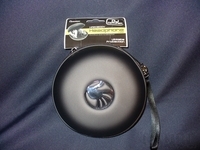 Slappa one of our lanparty sponsors was generous enough to send us out one of these HardBody Headphone cases. 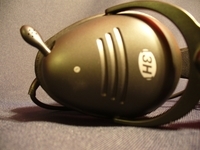 Its designed and made for headphones but it will work just as well with the addition of a microphone. Click to find out how it performed for us. We have reviewed a few headsets in the past and im sure we will review many more in the future. This is because as far as peripherals go the idea of a perfect headset ranges very widely from person to person. Everyone prefers a different size, shape, color, materials to make it comfortable for them. Not to mention the WIDE range of variables in everyone’s idea of good sound quality. Today we are going to take a closer look at the Sonar 5.1 headset from Cyber Snipa. We are going to find out if it is the perfect gaming headset for people who prefer “over the ear” headsets (me). Quality audio, despite the bemoaning of many, has proven time and again to be subjective to the listener. This allows for a wide base for competition within the industry, and serves to cause confusion among the average consumer. For instance, a quality set of 5.1 headphones can come in quite handy when gaming on the PC. You know your enemies' every move, every blade of grass crushed underfoot as they make a desperate attempt to flank you. It is a futile effort, unfortunately for them you can track them with your now acute sense of hearing. Audiophiles cry out, however, "5.1 headphones sound terrible when it comes to music!" So you can see the predicament these companies are in. By catering to one group they are ignored by the other. Tritton Technologies was kind enough to send us a pair of their AX51 5.1 Gaming Headsets in order to determine how they compare when faced with the rigors of gaming audio as well as music.